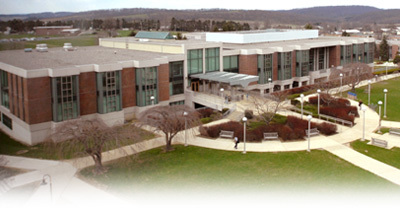 Rohrbach Library is near the center of North Campus (i.e., north of Main Street/Kutztown Road) of Kutztown University of Pennsylvania. Our entrance faces the large grass common area bounded by Boehm Hall, Schaeffer Auditorium, and the Student Union Building. This map shows the parking areas nearest Rohrbach Library. You can also consult a complete online KU Campus Map. Warning: Parking on campus is restricted most of the time. Do not park in loading zones or other forbidden areas as you can be ticketed and/or towed. For more information about parking on campus, consult Public Safety's Visitor Parking page or call 610-683-4002. Rohrbach Library seen from the southwest. Bus service to Kutztown is offered by Bieber Tourways, whose home terminal is two blocks east of campus on Vine Street: 610-683-7333. A free in-town shuttle bus for KU students runs six days a week through Fall and Spring semesters; its closest stop to Rohrbach Library is on the east side of the Student Union. The very few Handicapped parking spaces near our rear door can be reached by car via paved campus footpaths from Lot A2 beside College Boulevard. The path is shown in this map; call KU Public Safety at 610-683-4002 to arrange entry through the non-public rear door. From US-222 N/Allentown Pike, take the Kutztown Road exit. At 2.1 miles—just after passing between the historic main campus buildings—turn left at the College Boulevard traffic light. Then, as you head downhill, the second left leads to metered parking near the Student Union (Lot A1); the third left leads to Lot A2 which is not metered but does require a parking pass until 4:30pm on weekdays. Take Hamilton Boulevard/US-222 S out of Allentown. After US-222 joins Schantz Road near Premise Made Candies, continue four miles and take the E. Main Street exit into Kutztown. Proceed almost two miles; after passing through downtown Kutztown, at the top of the hill turn right at the College Boulevard traffic light. Then, as you head downhill, the second left leads to metered parking near the Student Union (Lot A1); the third left leads to Lot A2 which is not metered but does require a parking pass until 4:30pm on weekdays..
Use Exit 40 for PA-737 S to Kutztown/Krumsville. You'll drive 5.5 miles down a winding, wooded road; watch for Mennonite horsedrawn carriages. PA-737 S becomes Constitution Boulevard; when you reach a stoplight with a Turkey Hill on one corner, turn right on W. Main Street. Go one-half mile up through downtown Kutztown; at the top of the hill turn right at the College Boulevard traffic light. Then, as you head downhill, the second left leads to metered parking near the Student Union (Lot A1); the third left leads to Lot A2 which is not metered but does require a parking pass until 4:30pm on weekdays.